Hello everybody! I'm back with a new card. This one was made for 2 were special people - my grandparents. They just celebrated their 60th wedding anniversary (wow, right?!). 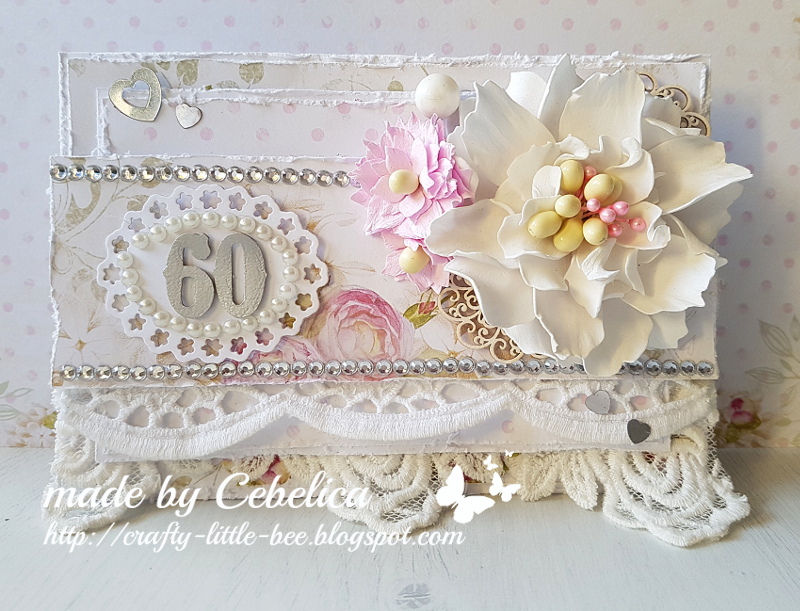 I really wanted to make a shabby chic/romantic card for them and this is what I came up with. 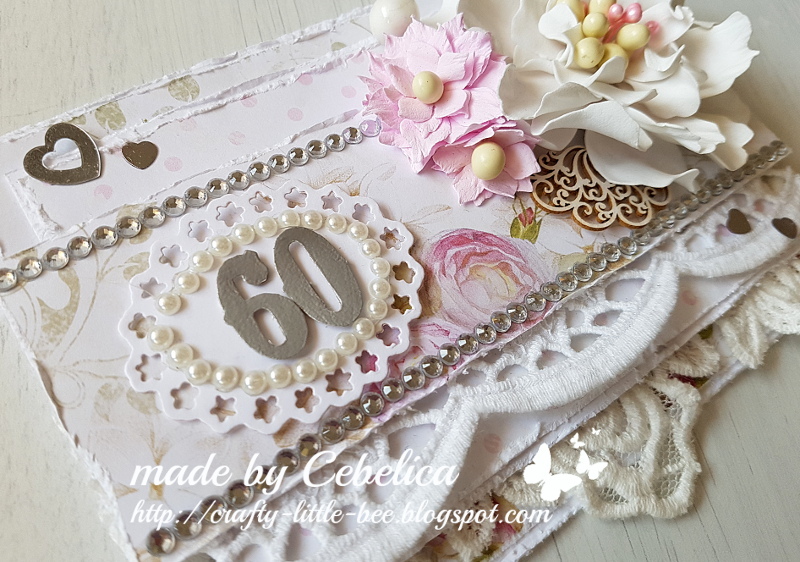 I had these gorgeous shabby chic papers in my stash and I thought they would be perfect for my project. To achieve a (more) romantic look I added lace, pearls and flowers. I also used some crystals, chipboard peices and heart shaped sequins to decorate the card. I distressed the edges with my scissors. 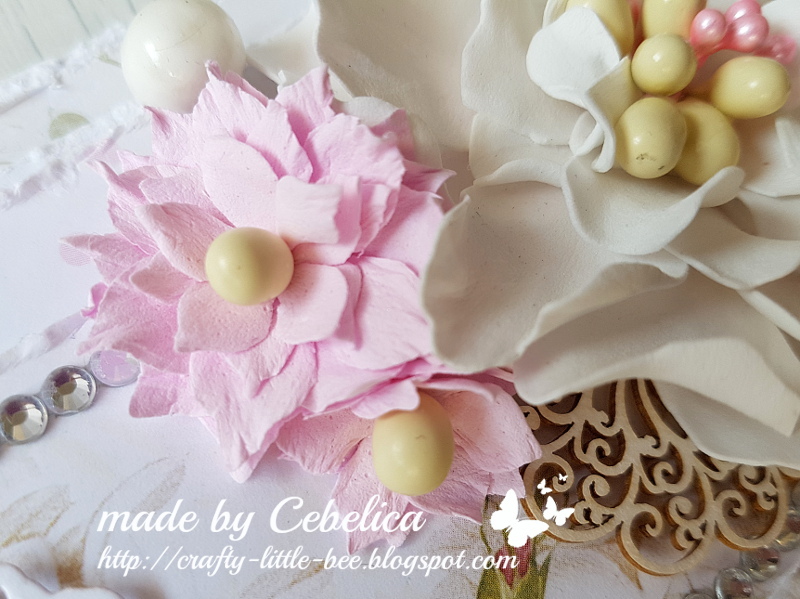 I made the flowers myself - I used white and pale pink foamiran to make them. You fan find foamiran in lots of different colours at Magnolia-licious store. To make the big flower I used Tim Holtz's Tattered florals die and for the small (pink) flowers I used Rosy dot AC3 dies. 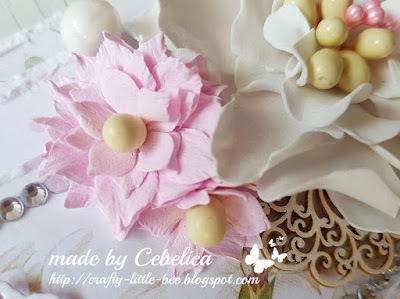 For the center of the flowers I used different stamens from Magnolia-licious store. Just BEAUTIFUL!! Love those flowers! Thanks so much for joining in the fun at our Double D ‘May Flowers’ challenge! Good Luck and we hope you’ll come back often. 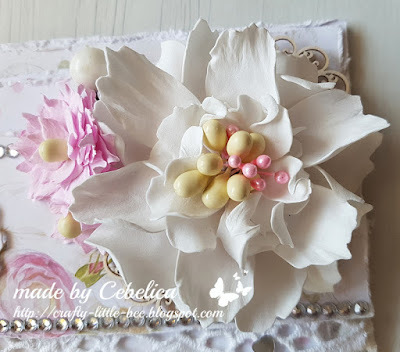 Beautiful card - I admire the beautiful flowers of foamiran. Oh my this is stunning. Oh My Word! This is glorious! What a wonderful celebration! We'll celebrate 30 years in July, halfway there! lol Beautiful layering and gorgeous accents! Your flowers are magnificent! Ooops and in my haste! lol Thanks so much for playing along with us at The Double D Challenge Blog, May Flowers, Donna, DT Member. Wow! This is gorgeous! Such amazing touches! Thanks for sharing with us at Cupcake Inspirations! vau, osupljiva je v vsej svoji lepoti!